The rain has been falling down. It reminds me each time I roamed. ^ a b c d e Roy J. Harris, Jr.. “The Best-Selling Record of All. 'White Christmas' and the reasons it endures”. Wall Street Journal 2009年12月5日. http://online.wsj.com/article/SB10001424052748703499404574561734246276554.html 2009年12月6日閲覧. "It was a peaceful song that became a wartime classic. Its unorthodox, melancholy melody—and mere 54 words, expressing the simple yearning for a return to happier times—sounded instantly familiar when sung by America's favorite crooner. 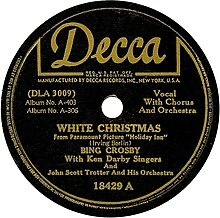 But 67 years after its introduction, some still are surprised to learn that Bing Crosby's recording of the Irving Berlin ballad "White Christmas" became not only the runaway smash-hit for the World War II holidays, but the best-selling record of all time." ^ a b c d e f John Mueller (1986). Astaire Dancing - The Musical Films. London: Hamish Hamilton. pp. 204, 425. ISBN 0-241-11749-6. ^ Whitburn, Joel (2004). Top R&B/Hip-Hop Singles: 1942-2004. Record Research. p. 139. ^ Top 40 Christmas Songs (Lyrical) - ItsRanked! ^ CD sleeve: Billboard Greatest Christmas Hits (1955 - Present), 1989 Rhino Records Inc.